Directions: Boil ingredients together for 15 minutes. Strain, cool then refrigerate. Pour over clean hair after shampooing and let the rinse sit for 2 minutes. Rinse, then condition. Directions: Boil ingredients. Strain and pour into a container. Massage solution into the scalp, Do not rinse out. Ingredients 4 teaspoons of water, 2 teaspoons of apple cider vinegar, 3 drops of lemon essential oil. Directions: Combine the apple cider, lemon oil and water, stir. Pour through hair to soften the hair and remove styling product buildup. Directions: Boil water with spearmint leaves. Cool and refrigerate. Use as an after-shampoo rinse. Ingredients: 1 ounce apple cider vinegar, 1 quart of distilled water. Directions Mix. Comb through clean, wet hair. Leave on for 10 minutes and rinse. Directions: Make an infusion of the herbs, steeping at least 20 minutes. Allow to cool. Combine the apple cider, stir. Pour through hair then rinse well. Directions: Make an infusion of the herbs, steeping at least 20 minutes. Allow to cool. Combine the apple cider, stir. Pour through hair to get rid of buildup and soften hair at the same time. Apple cider vinegar is commonly used in hair rinses to remove build up from styling products, shampoos, conditioners and minerals found in tap water. 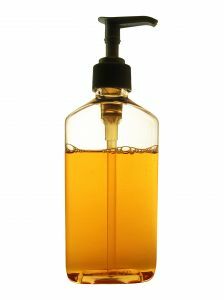 Vinegar also restore the natural PH balance of the scalp and hair. It also closes down the cuticle, leaving you with shiny, healthier hair. With these simple recipes, you can maintain your hair PH level at home and treat hair and scalp ailments such as dandruff, styling build up and more. Use a rinse once a week. Directions: Mix and store in a glass jar till ready to use. Dilute 1 tablespoon of the vinegar/essential oil mixture in 2 cups of water. Pour over hair. Use a bowl to catch the liquid and reapply to hair.